Carlos Zárate paleontologist and geologist Antonio Peláez found in an area of quarries in the District of Zana, province of Chiclayo, a backbone of 5.9 cm with six dorsal vertebrae and ribs, attached to a flap that caught the attention of explorers, according to the newspaper "The Republic". 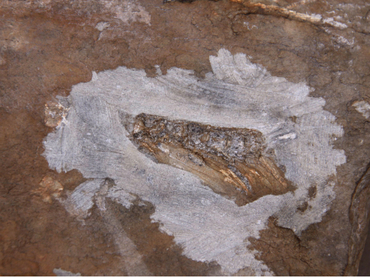 The fish fossil was found in a block of sedimented rock of 70 centimeters long and 30 centimetres wide, with 20 kilos of weight. According to the information collected by the newspaper, the area where the fossil was found in the Lambayeque region on the North coast of Peru 780 kilometers north of Lima, was covered by the sea more than 100 million years ago. "We were surprised, when we have removed the huge rock that covered the flap, to find a part of the spine," said Zarate to "La República". The discovery was made 40 kilometres southeast of Chiclayo, the capital of Lambayeque, by the team of experts from the Museum of natural sciences concerned with the activity of front loaders who have begun to destroy an area of quarries to extract stone for the construction.